Parents know the agony of putting a child to bed. Storyboard to establish the context and problem addressed by Bedtime Bingo. What if we could make it a little more enjoyable? My idea was simple: populate a conventional bingo board with the myriad excuses and tactics--legitimate or devious--used by children to evade sleep. Then, let your child(ren) be the unwitting "bingo caller(s)." But simple ideas are not always simple to execute--or worthwhile, for that matter. Would this twist on traditional bingo actually be enjoyable? Would it improve the bedtime experience? Would parents, whose brains and time are already taxed, play more than once, or would it be a mere novelty, a funny/clever idea? These were some of the concerns guiding early development. To improve the product's long-term value, I brainstormed ways to increase BedTime Bingo's staying power, focusing on the distinctive characteristics of mobile phones and their apps. Beyond the gamification inherent in the idea, BedTime Bingo could become a social experience and a way to learn more about your child(ren). By playing against your friends, you could transform a frustrating, solitary experience into a shared one, marked by empathy, commiseration, and a laugh or two. Furthermore, by remembering and analyzing your used game boards, the app could become a sort of analytics tracker for your child's bedtime habits, giving occasion for reflection on your parenting strategies. With these features in view, I began by imagining a few usage scenarios, followed by high-level journey mapping, identifying key moments along that path. Then, using the journey map, I began making suitable wireframes of the most crucial touchpoint, which is the actual game play (as opposed to, say, onboarding or other auxiliary moments). Process notes and sketches: scenarios, user flows, interaction design, icon thumbnails. Once I had iterated several times, it was time to print out the Balsamiq wireframes and do some quick-and-dirty, lo-fi usability testing. I did the test in the context of a small class, so I was unable to screen my users to ensure I was only testing with my target audience, so more testing will be required but, nonetheless, it was useful. With each participant I laid out the task they were to accomplish, being careful not to use language that would be leading. Along the way I asked neutral, open ended questions, such as "What would you do next?" and "What do you expect to see if you click on that?" The feedback was both surprising and helpful and provided plenty of fodder for further iterations. 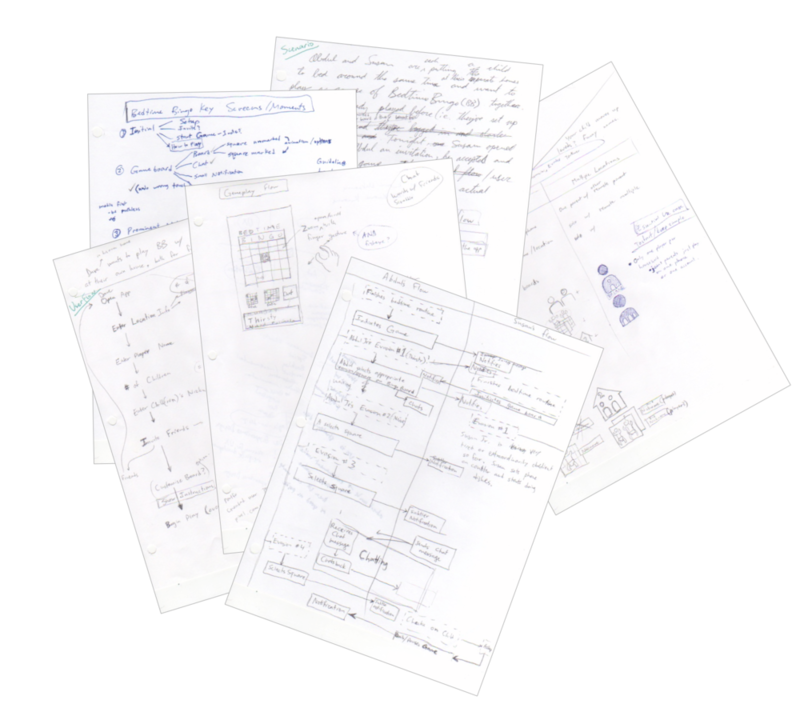 Some early wireframes used for paper prototype usability testing. Development of BedTime Bingo has been put on pause but when I resume I will continue usability testing with more targeted users and will continue to refine the UI and the gameplay interaction design.